butterfly cluster, originally uploaded by hep. this weekend we did some hiking. i will post about that later. monday we went with the children and some family friends to monterey for the day to see the butterflies in their wintering over spot at Pacific Grove. monarchs are amazing, during the migration season they can fly over 100miles a day at heights of up to 10,000feet. and most amazing of all is the fact that they have never been there before, it is not a repeat migration for the individual insects. 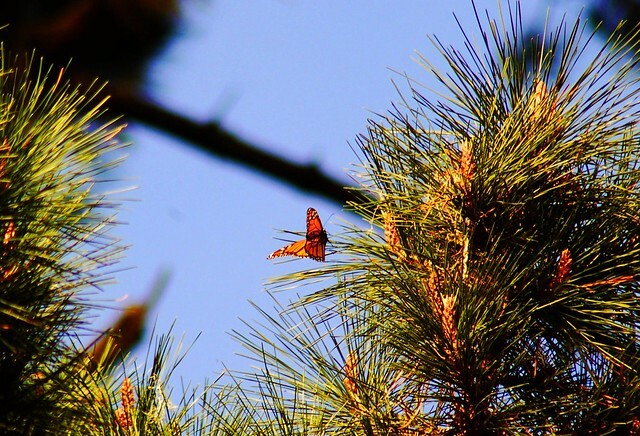 several generations of monarchs live and die each year, and the individual monarchs head back to what would have been their grandparents' or great-grandparents' overwintering spot from the previous year. we were particularly concerned to see the low count this year again. 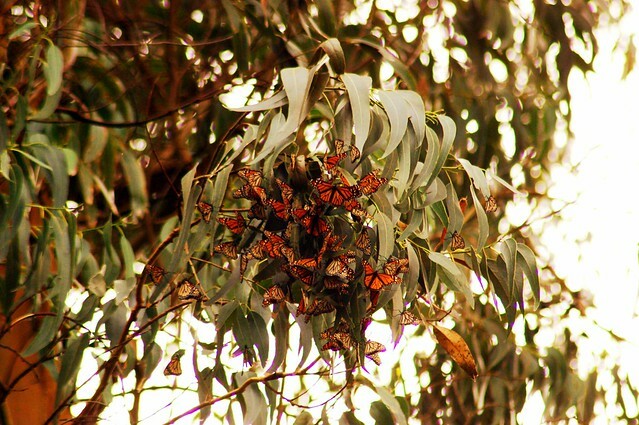 in 2009 there was a disasterous tree-trimming incident that decimated the grove of branches the butterflies would find acceptable to cluster (and to be clear, the fault for this incident lies entirely with the pacific grove city council and city management, and NOT the grove caretakers.). 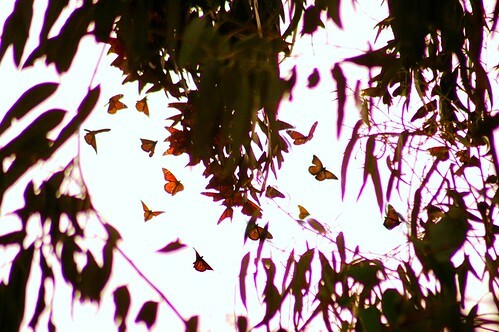 the grove is bare of branches which the butterflies would find habitable that keeps them both warm enough to move, but not too warm so as to overheat and die. 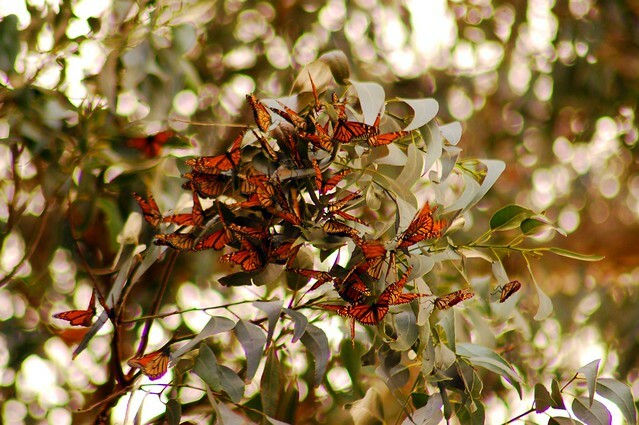 whereas in years past they clustered on almost every tree, each branch weighted down with its load of individually light butterflies, but this year the butterflies clearly preferred only two spots in the entire grove. 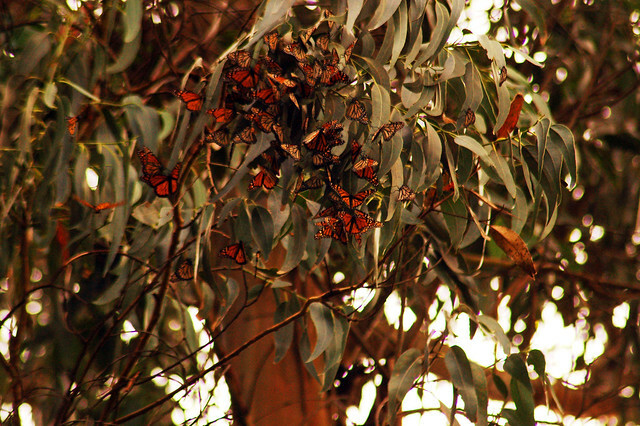 many trees were completely bare of any butterflies at all. the numbers are still drastically low, with as few as 2000 butterflies overwintering there currently (down some 60-80% from previous years before the trimming) whether this is a result of this habitat being manipulated, or wider issue of other habitats being removed or degraded (milkweed is the only food of the juvenile caterpillars, which is not nearly as widespread as it was even 10yr ago) is unclear, but the numbers are definitely showing a yearly pattern of decreasing, in 2009 the numbers were under 1000 every week, in a time that usually sees tens of thousands of butterflies returning (sometimes as many as 20,000 at once). on the way home we also stopped in at natural bridges grove which was also almost totally barren of wintering butterflies, at a spot that usually sees over 100,000 return each year. on the plus side i get to be a state park photographer this year cataloging the butterfly return next winter AND documenting tidepool life during the rest of the year. so this week i managed to finally wrap up and finish one job, only to replace it with another in my pattern of "having 100 jobs at all times". This is absolutely amazing and beautiful! if you are a flickr memeber, then if you click the image it will take you to the flickr page where you can order prints. if you have never ordered prints off flickr, there is a light grey button directly above the image that says Actions which will bring up a dropdown menu that will have an "Order Prints and more" option. I have it set to let any member order prints so as long as you are a member you should be good (let me know if you are not). unfortunately they do not let me allow non-members to order, so if you aren't a member just message me a mailing addr and i can send you whatever size you want next time i do a giant print order. i think the prices are something like 9cents for 4x6s, 70cents for 5x7, $2.99 for 8x10, and beyond that size i forget because i never print that. I love your journal. It's the perfect mix of words and pictures, methinks. <3. i have always liked pictures more than words. mostly because, even tho i type fast, i am lazy and hate processing out walls 'o' text.